Split-second decisions are always the ones that changes our lives. You could either decide to act on a life-changing situation, or you choose to stay put. Just like the split-second decision this mum made that changed his and others’ lives. Michelle Sadler, 41, has spotted killer James Fairweather lurking in the bushes on the Salary Brook Trail in Colchester in May last year. She instinctively made the decision to report the sighting to authorities. This act has been awarded by the Gazette and the Minister for Policing. Ms. Sadler saw Fairweather hop from one bush to another along the trail. She immediately called 101, rather than 999 to avoid scaring Fairweather off with police sirens. What a smart decision that was. On March 29, 2014, Fairweather was caught and found guilty of stabbing 31-year-old Saudi student, Nahid Almanea, on the same trail almost exactly a year before, and 33-year-old father James Attfield in Castle Park. Fairweather was only 17-year-old. He was sentenced to a minimum of 27 years in jail after a two-week trail in April. It was truly good that he was caught because Fairweather revealed that he was planning to kill again. Ms. Sadler who lives off Longridge in Colchester was given a Gazette Community Champion Award at the Houses of Parliament on Tuesday. 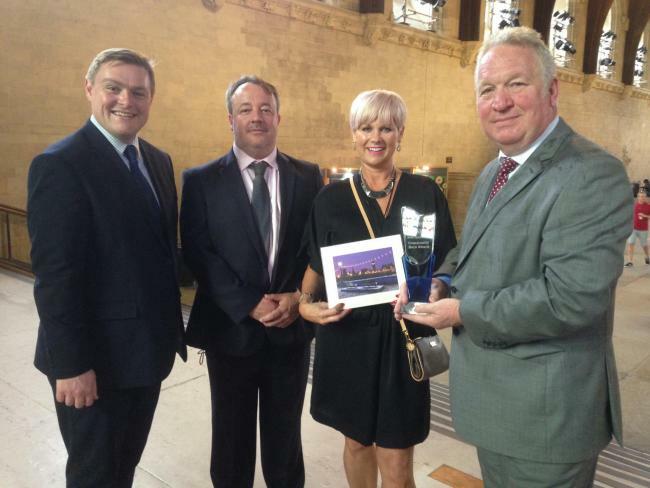 She was presented with the trophy alongside Mike Penning, Minister for Policing, and Gazette Editor, James Willis. Ms. Sagler was also treated to a tour by Colchester MP, Will Quince. MS. Sagler stated and we quote: “It was such a lovely experience which I imagine I will never do again in a lifetime. “I have been overwhelmed by the support of people, not only in Colchester as I have had messages sent from as far as Australia as it made their papers. She added: “The strangest thing is knowing that you are responsible for putting someone in prison for a long time. Obviously that’s not a normal thing that happens and I just pray that he never comes out. Editor James Wills said: “We, and the people of Colchester, felt Michelle’s bravery and quick-thinking deserved recognition.